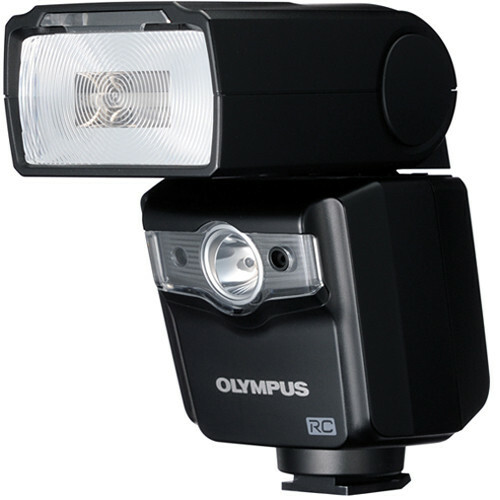 The Olympus FL-600R Wireless Electronic Flash is an easy-to-use external flash boasting a wide LCD and wireless control. An integrated LED light is capable of functioning as an AF illuminator for still images or full-time auxiliary lighting for video capture. Usable as a bounce flash, the FL-600R tilts upward to 90Â° and downward to 7.0Â°, and also swivels side-to-side up to 180Â° in each direction. The unit features a built-in wide panel and catch light plate, so you need not worry about misplacing them during travel. The flash settings are adjustable via the arrow keys and dial on the rear of the unit, or by using the controls on an attached camera. When used in wireless mode, the FL-600R has an integrated commander function for remotely firing other wireless flash units without firing itself. A versatile unit, it may also be used as a slave flash, controlled via a camera's built-in flash or another commander unit. As many as 3 groups of flashes, as well as a clip-on flash like the FL-LM2, can be configured independently. There are 4 wireless channels available, preventing interference from other photographers' flashes. The FL-600R can also be attached and locked securely onto a camera's hot shoe, or mounted externally with a compatible flash bracket and cable like the FL-BK01, FL-BKP02, FL-BKM03 or FL-BK04.P> Drawing its power from 4 AA alkaline or Ni-MH batteries, the FL-600R's charging time is roughly half that of the FL-50R, enabling you to get back to shooting even faster.P> Note! Wireless mode not fully functional with OLYMPUS PEN E-P1, E-1 or Evolt 300 \ 330 \ 410 \ 500 \ 510. Wireless Mode only works in Manual mode (not TTL) on flash. Flash provides TTL when mounted directly on these models.P> Wireless TTL mode possible with SP-560UZ, SP-565UZ, SP-570UZ and SP-590UZ, which do not have hotshoe. Firmware (available via OLYMPUS Master 2 / Digital Camera Updater software) of SP-560 UZ must be updated to provide functionality.The Olympus FL-600R Wireless Electronic Flash is an easy-to-use external flash boasting a wide LCD and wireless control. An integrated LED light is capable of functioning as an AF illuminator for still images or full-time auxiliary lighting for video capture. Usable as a bounce flash, the FL-600R tilts upward to 90Â° and downward to 7.0Â°, and also swivels side-to-side up to 180Â° in each direction. The unit features a built-in wide panel and catch light plate, so you need not worry about misplacing them during travel. The flash settings are adjustable via the arrow keys and dial on the rear of the unit, or by using the controls on an attached camera.